CB-1® Weight Gainer is a natural weight gain pill. 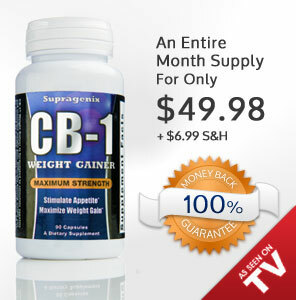 CB-1® was designed for people who struggle to put on weight and suffer from a fast metabolism or weak appetite. 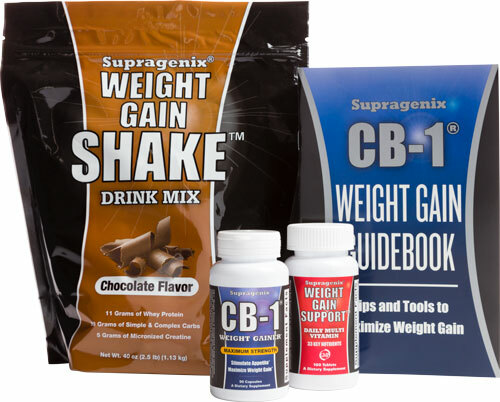 Every order includes the CB-1® Weight Gain Guidebook. This exclusive guide covers everything you need to know about reaching and maintaining your weight gain goal, from calories and supplements, to nutrition and exercise. † In an 8 week clinical study, subjects gained an average of 3.0 pounds after taking CB-1 Weight Gainer for 4 weeks. During an additional 4 weeks of follow-up, after CB-1 was discontinued, subjects maintained the weight they had gained.